This Quick Caprese Pasta post has been compensated by Collective Bias, Inc. and its advertiser. All opinions are mine alone. 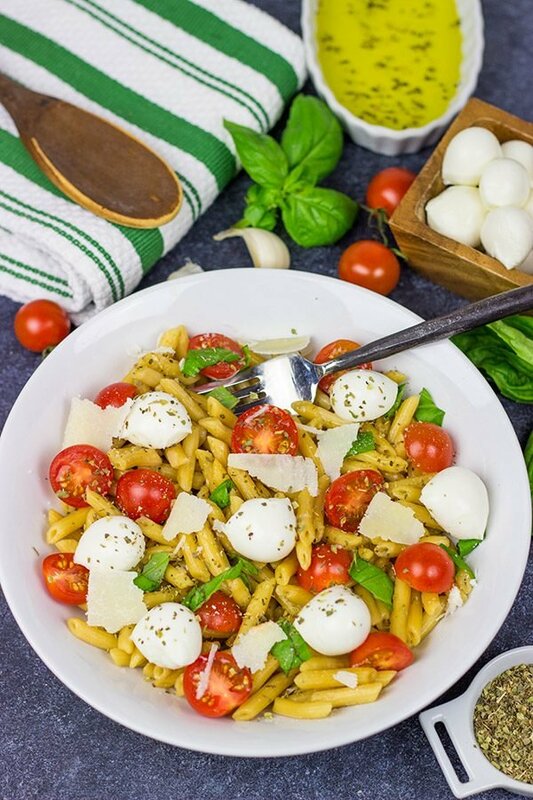 This Quick Caprese Pasta is loaded with flavor…and it’s ready in just 10 minutes! This past Spring, Laura took Robbie down to her hometown to visit for the weekend. I stayed back to take care of the dogs because travelling with Robbie + 2 dogs is pretty much our limit. We did that one time, and it was nuts. We actually had to cut up an old (very large) cardboard box and create a “wall” to keep Max from jumping up into Robbie’s lap in his carseat. Yeah, that happened. In addition to catching up on sleep, I also spent that entire weekend planting our garden. The weeds had taken over last year, so I dug out all of the dirt to get rid of any weed seeds. Then I planted a variety of our favorites: basil, oregano, tomatoes, lettuce, snap peas, zucchini and jalapenos. And carrots. Because our local nursery had carrots, and they sounded like fun. Fast forward about a month. The rabbits somehow got through the fence and mowed down the snap peas, lettuce and most of the carrots. Oh well. I like to think that I’m feeding the local wildlife. However, the rabbits left the jalapenos alone…imagine that! And the basil. Apparently the backyard critters don’t have a taste for herbs, so I tend to go a little heavy on the herb plants. I might have kinda overdone it on basil this year. As in, we have about 5-6 huge basil plants in our garden. Well, had is more accurate. I pulled up most of those basil plants and turned them into pesto last weekend. (I freeze pesto in ice cube trays so we can use it for easy meals all winter long.) We must have made about 2 gallons of pesto…seriously! We’ve been using the remainder of the fresh basil in all sorts of dishes lately. With a toddler in the house, Laura and I need easy dinners. Oftentimes, we have leftovers from one of my cooking adventures. However, when the leftovers are gone, pasta is one of our go-to weeknight dinners. It’s quick, easy and Italian. (Did I mention that Laura is half-Italian? Pasta is totally her thing!) Speaking of pasta, have you seen Barilla’s new line of Ready Pasta? 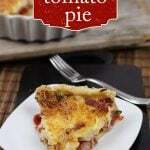 It’s perfect for nights when you need a super quick dinner! 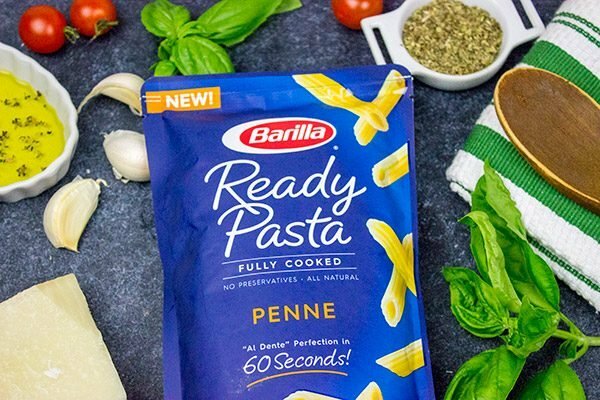 Barilla’s Ready Pasta is just that. Ready pasta. It’s pre-cooked pasta that can be microwaved to al dente in just 60 seconds. (Click here for a quick video showing how to cook Ready Pasta.) And the only ingredients are extra-virgin olive oil, sea salt and fully-cooked pasta. It really is that easy! 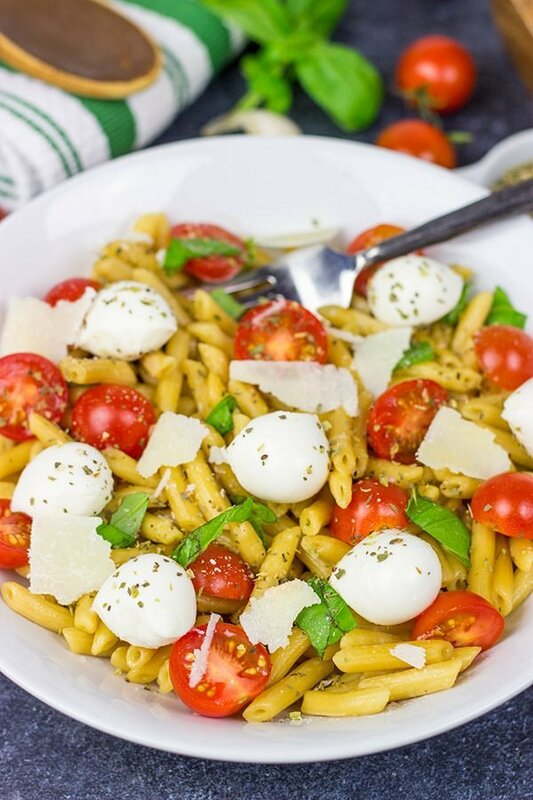 We picked up a pack of Penne Ready Pasta last time we were in Target, and then we turned it into this Quick Caprese Pasta. Caprese salads are simply fresh mozzarella, basil, tomatoes, salt and olive oil. So adding those ingredients to this pasta led to one super delicious weeknight dinner. And guess how long it took to make this Quick Caprese Pasta? 10 minutes. #NotKidding. Oh, and get this. 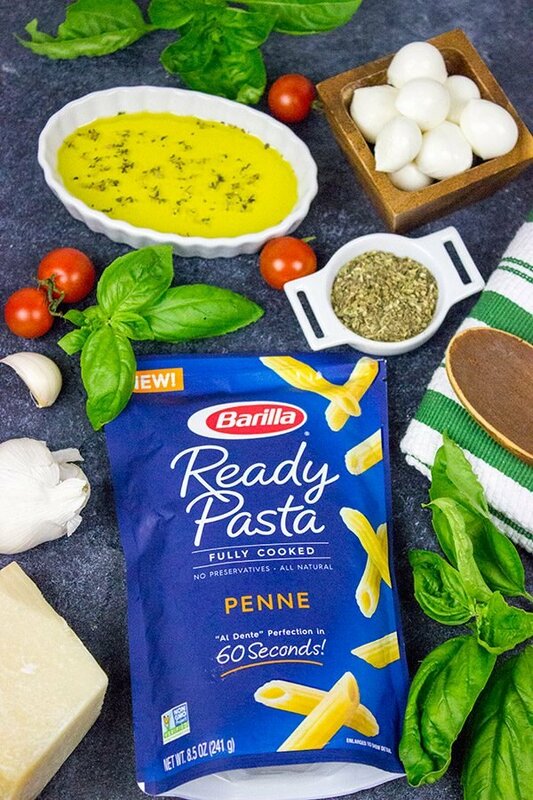 Barilla’s Ready Pasta doesn’t require refrigeration. That means you could totally pack this one for lunch at the office. No boiling water needed. Just a microwave. And there’s no sacrifice in quality here. Just delicious pasta ready in a New York minute. Our love for Italian food is pretty obvious. Italian recipes are often pretty easy to make, and the ingredient list is usually rather short. The key to delicious Italian food is quality ingredients. Use real Parmesan cheese. And, if you can, grate it yourself. Use fresh basil from the garden. (You can borrow some of mine…we have plenty!) Use good quality olive oil and pasta. And for this Quick Caprese Pasta to come together in just 10 minutes? Yeah, that’s the perfect dinner for those nights when Robbie stays up a little later than normal. Enjoy! 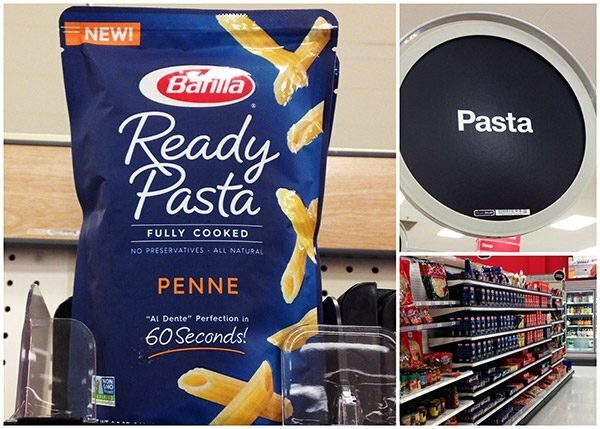 Cook Barilla Ready Pasta Penne according to package directions. 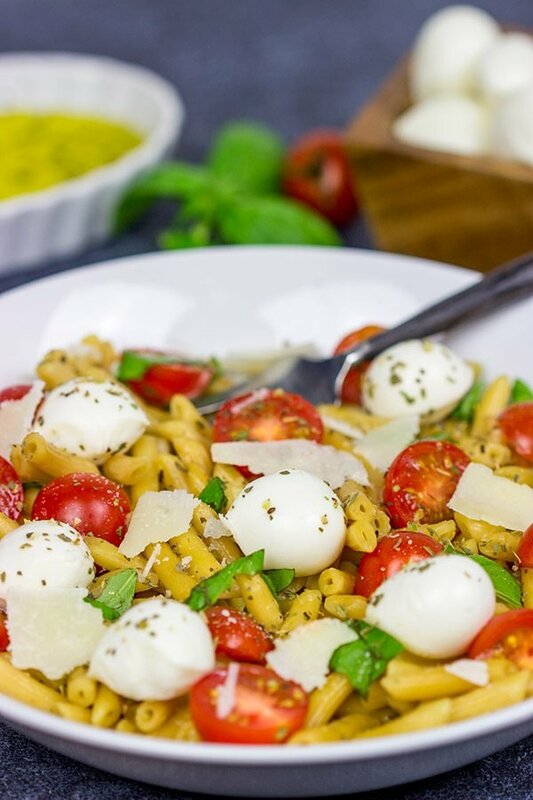 Using a large bowl, add cooked pasta, olive oil, tomatoes, basil, salt, dried Italian seasonings and fresh mozzarella balls; toss until well combined. Divide pasta mixture into 2 bowls and top with additional fresh basil and Parmesan. Okay, so… when did you say you were sending my an extra large tupperwear of that? Today you say? great! Haha! I missed the cutoff for the mail the other day, but I’ll get a large container of this on the way to you today, Johlene! 🙂 Thank you for the kind words, my friend! Oh my goodness. Where to start? I can’t stop laughing at the picture of Max jumping into Robbie’s lap. Was it as funny at the time? Those BASIL PLANTS! For the life of me I can’t figure out how to grow basil. It just always dies on me. UGH. And pre-cooked pasta? That is my lazy girl’s dream come true. I’m going to stock up, then hope you’ll send me some of your pesto :). Thanks in advance! Happy Thursday! See, Max jumping right into Robbie’s lap was SO not funny at the time. Robbie started screaming. Max was just confused. It was a hot mess. So we resorted to the cardboard wall. I can only imagine what people thought if they looked over into our backseat while we were driving down the road. Haha! So we need to talk about basil, Kelsie. I’ve always had good luck with it. I’m going to blame the 167° temps that you guys have out there in Phoenix. Either way, I have WAY more pesto than I can possibly use…so I’ll send some your way. 🙂 Hope you had a great long weekend, my friend! Your rabbits are the smart creatures, haha. Who needs jalapeno when they’ve got some carrots, eh? I’m just wondering why didn’t they like the basil. Also, I suggest to plant some lavender next spring to see how it goes. Maybe it scare them away, and you will enjoy more vegetables:) Anyway, it’s cool when you have your own herbs from the garden. We planted many different herbs as usual (Well, technically, Andrey planted. But I had helped to choose which plants to buy). Oh boy, every year they develop new kinds of herbs! This year we’ve got pineapple sage and caraway thyme. How awesome is that? And how awesome is this pasta? That’s my favorite kind – simpe yet always delicious. Caraway thyme? Interesting! I’ve never heard of that one. Does it taste much different than regular thyme? And I’m right there with ya on using fresh herbs with Italian meals. So delicious!! Thanks, Ben! Try using cut up pieces of Irish Spring soap around the perimeter. Keeps out rabbits and squirrels. I’m a sucker for Caprese salad because it’s an anti salad. I eat at least 7 salads a week sometimes more so capreses are a fun treat for me. 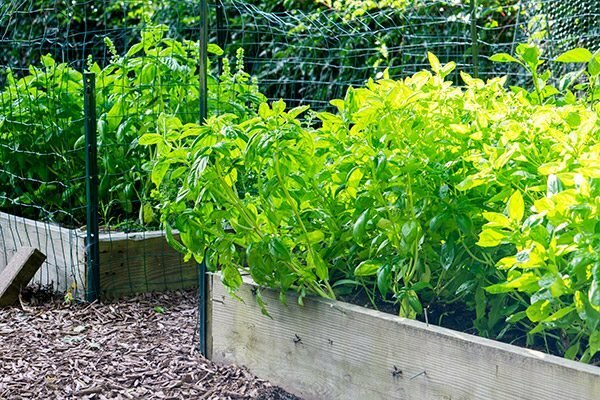 Your garden sounds fantastic, I can’t wait to see everything bloom and all the lovely recipes you will create for your farm to table ingredients. I remember you telling us about the rabbit’s destruction and them avoiding jalapeños, I get the tasted it and freaked out lol. 2 gallons of pesto with fresh basil from your garden… Yes, please. I would love a few cubes lol. Haha…I totally know what you mean about Caprese salad not being a salad at all. 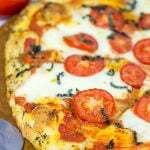 It’s just delicious cheese, tomatoes, basil and olive oil…and I love it!! So the garden is heading downhill for the year as it’s starting to get pretty chilly here at night. The basil is all done…turned into a TON of pesto that’s now in the freezer. The jalapenos still need to be picked, but they’re about done, too. Anyways, this recipe is SO easy, Mary. Totally comes together in 10 minutes. And the fresh herbs are just a bonus. 🙂 I’ll be happy to send you some pesto, too…we certainly have enough of it now. Haha! Thanks so much, my friend. I hope you had a great long weekend! Hi David! What a quick and delicious meal! Perfect for hot summer evenings. Basil is one plant rabbits don’t like; also fuzzy plants like sage. Planting certain flowers also helps deter them. Having dogs who regularly “mark” our property has deterred most everything (except stray cats, but that’s another story…). Yes, this meal comes together SO quickly! Literally 10 minutes. And it was super delicious, too. 🙂 So sage is another anti-rabbit plant? Ok, looks like we’ll be planting sage here next year. A couple of years ago, we had a groundhog mow down half of our garden in one night…but now it’s the rabbits that are a constant source of angst. I’ve heard of the flowers thing as a deterrent, but we’ve never tried that. I might have to research that a bit before planting next year’s garden. Either way, I hope you and Gary had a wonderful long weekend. 🙂 Thanks, Dorothy!! I am beyond jealous of all that basil, David! And this caprese pasta is the perfect way to let it shine. This is exactly the kind of dish that we’re living on right now – just perfect. Oh gosh, we ended up with SO much basil here, Marissa. And it just grows so well. I don’t think I quite comprehended how much basil we had until we started picking all of the leaves off to make pesto. Let’s just say we have a LOT of pesto now. Haha! 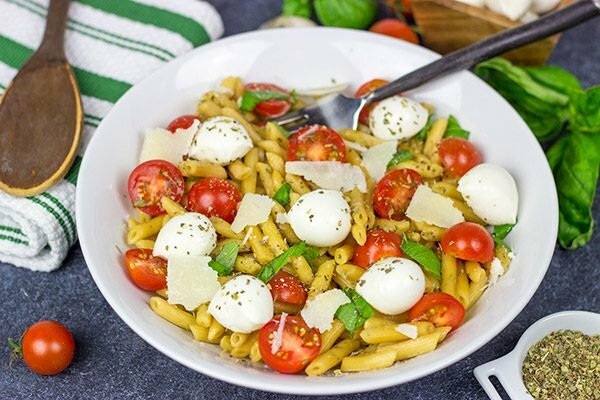 So this quick Caprese Pasta is perfect for busy days. All ready in 10 minutes. Seriously! 🙂 Thanks so much, my friend. I hope your week is off to a great start! I know about rabbits and gardens, we have the same problem. This they ate our broccoli plants. Love this Caprese pasta dish. I have not heard of this type of pasta I will have to look for it in the store. Oh man, your broccoli fell victim to the rabbits? That stinks! At least we’re feeding the local wildlife, right? Haha! Definitely check out this pasta next time you’re in the store, Dawn…it’s fairly new, but it’s totally awesome. And using it in this Caprese Pasta was fun since it includes tons of fresh (and easy) flavors. 🙂 I hope you had a great long weekend, my friend! I absolutely love caprese salad, so this dish sounds delicious! I am envious of your basil supply… it is my favorite herb. I love caprese salad!! Every ingredient is so fresh and delicious in it! This pasta recipe is defintely a keeper for those days when you have no time to cook dinner ;). Love it! P.S. I am a little jealous of that ready pasta.. Wish it was available in India too! I am right there with ya on caprese salad, Deepika! It’s such an easy and delicious dish…even if it’s not much of a “salad.” 🙂 So using those flavors in a pasta dish totally worked! And then using this ready pasta made the whole dish come together in 10 minutes total. 10 minutes! I hope they start selling this ready pasta over there in India…it’s so awesome for those nights when dinner gets pushed back until late and you have no idea what to make. Thanks so much, my friend! Holy Moly….That basil is amazing! Bummer about the rest of the garden, but I’m glad they left the basil and peppers alone. This pasta sounds so delicious! 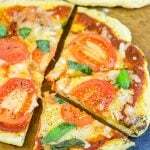 A perfect use for fresh basil and garden tomatoes! Hah! Yeah, the basil crop was amazing this year…but the rest of the garden? Eh. It was either strangely missing (ahem…bell peppers that never produced peppers) or mowed down by the rabbits. But I’m ok with the basil as we now have enough pesto for a small army! This pasta was super fun as it gave us a way to use some of that fresh basil…and it was ready in 10 minutes. That’s pretty much my definition of an easy weeknight meal right there! Thanks so much, Kathy…I hope you had a great long weekend. And school should be starting back for you pretty soon here, huh? Good luck!! This really is one heck of a delicious meal, Nicole! I love all of the fresh flavors, and the whole thing comes together in 10 minutes. That’s pretty much perfection for busy weeknights! 🙂 Thanks so much, my friend. I hope you guys had an awesome long weekend! David, you are the master of taking the favors of one dish and putting them into another. I love all that a basil. I wish I grew it, I just buy the plant from Trader Joe’s and try to remember to water it every day. So maybe that’s the reason I never have pesto when I need it. But this dish is beautiful! I haven’t seen ready-cooked pasta here, but I’ll be looking! So that’s part of the reason we ended up with so much basil, Laura! At the beginning of the year, I would buy the little plants instead of just basil leaves whenever I needed fresh basil. Then I would plant them out in the garden. We’ve had a lot of rain this summer, so we didn’t need to water those plants too much…and the next thing we knew we had a massive load of basil leaves! And now we have a ton of pesto in the freezer. 🙂 So do keep an eye out for this ready pasta. It’s perfect for those busy weeknights…and it comes together in 10 minutes. 10 minutes! Thanks so much, my friend! maybe your next venture is a pesto factory? (; normally i’m just happy with plain caprese but this sounds much more dinner worthy! Pasta is an Italian dish and who don’t like to have it. I think I’ll make pasta on Saturday and Sunday and will follow your recipe, as it’s looking very delicious. Thank you.